The big news this week is that our fab student nurse Elin is no longer a student! Elin had the results for he practical exams this week and passed with flying colours. Elin has now finished all her training and exams and is a fully qualified veterinary nurse. 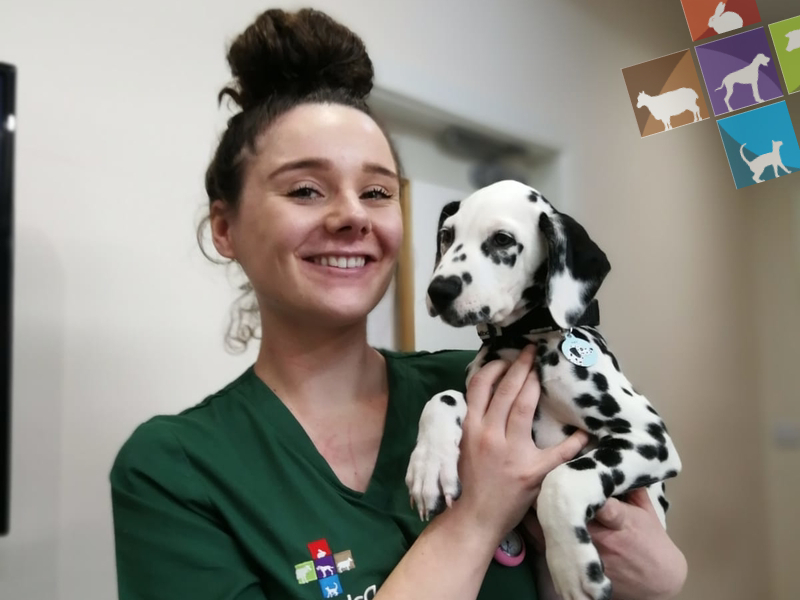 We are so happy for her and we’re sure she’s going to have an amazing career as a registered veterinary nurse! We have had some fabulous success stories lately in our Chub Club. We also know a lot of people start January with “New Year, new you”. It would be great to do the same for your cats and dogs if they are carrying a bit of extra “winter weight”. To help kick start your pet’s diet, we are offering 20% off all Royal Canin Satiety products*. Satiety is great food to aid weight loss as it keeps your pet feeling fuller for longer, and has a high protein content to help maintain muscle mass whilst dieting. If you are interested in starting your pet on their weight loss journey then give us a call to book in for a free Chub Club appointment. We have recently had Clare join the Daleside team. Clare is an RVN who has just returned to work after maternity leave. Clare was previously working for the Dogs Trust, travelling round educating the general public on good pet welfare. Clare has also worked in an exotic specialist veterinary practice in Tarpoley, so the nurses here are looking forward to picking up some new skills from her. Clare will soon be running nurse clinics in our Shotton branch so we’re sure many of you will get to meet her. Pet insurance is becoming more and more important with the advancement of veterinary medicine. The average pet insurance claim is £750 and many can run into the thousands with specialist treatments. Did you know that you are 3 times more likely to claim on your pet insurance than on your car insurance? This has never been more evident to our vet Vanessa this week. Her little dog, Frank, had to be referred to a specialist veterinary hospital for an MRI scan and spinal surgery. Needless to say this doesn’t come cheap! Unfortunately for Vanessa, she hadn’t got round to sorting insurance for Frank, so she will be footing the bill herself! This just goes to show how important it is to insure your pets, as you never know when they will need it.